Bob Holtzman's Indigenous Boats blog deals with, you guessed it, indigenous boats. 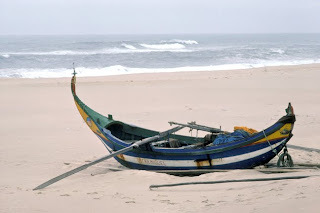 The purpose of this blog entry is to link the indigenous boat to the indigenous soul. The indigenous soul is a term that I had not encountered until yesterday in an article written by Martin Prechtel. Here is a link to the article on the Indigenous Soul. The article offers some insights on how indigenous cultures view and deal with technology. 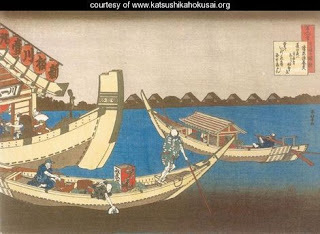 Though the article does not deal expressly with boats, the ideas expressed in it nevertheless apply. Boat building echnology is after all technology. One idea that Prechtel presents is a mechanism that limits the amount of technology that the indigenous soul will allow. 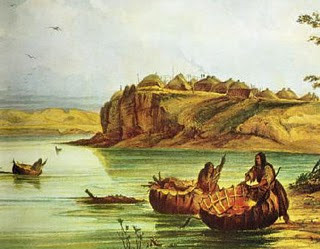 I have personally found something satisfying in building indigenous boats that I don't think I would get from building them in a more modern fashion. But I could never quite justify why I felt that building a skin on frame kayak might be better than laying up fiberglass and resin in a mold. Prechtel offers a justification from the perspective of indigenous culture. Essentially, in an indigenous culture, every extraction of a resource from the earth must be paid for in ritual. The ritual pays the debt we owe the earth for extracting that resource. The ritual is one of thanks. Prechtel proposes that the Mayans would never have built anything as complex as a car because the amount of ritual that would have to go into paying for the debt that its production creates would simply be prohibitive. The building of a skin on frame kayak probably creates as much debt as a single individual can pay off in a reasonable amount of time. Aleuts, for instance took a whole year to collect the materials needed to build a kayak. That was probably enough time to pay for the debt that was incurred. Prechtel also introduces the idea that the creation of something beautiful is another way that we can pay off debt. Hence, the importance of building boats that look good. Simply by making a good-looking boat, you have much less debt to repay than if you build an ugly one. I personally always thought that making an ugly boat was a crime against nature. I may have more to say on this topic in the future. I first met Tim Anderson a few years ago when I was out front working on a boat and he just happened to be driving by and stopped. Turns out he was working only about a mile away on whatever. Whatever covers a lot of ground, but the part of whatever that I was interested in was boat building. Tim builds boats after a fashion. I say, after a fashion, because he doesn't build boats the way you see it done in books. Tim seldom starts from scratch. Someone somewhere is always discarding boat parts like for instance, sails, spars, hulls, aluminum tubing, shopping carts, you name it, and out of these things, Tim builds working boats, mostly outriggers. You can follow Tim's adventures by going to his website. The first link on the page will take you over to the instructables site. What is instructables? Goofy name, sure, but it's mostly a how-to website with how-to stuff contributed for free by the community. Tim has over 200 how-to's published there on a variety of topics, lots of them on the subject of boats and sails. Tim is nothing if not innovative and never shy about repurposing. He is a true 21st century boat builder, kickstarting the salvage economy. 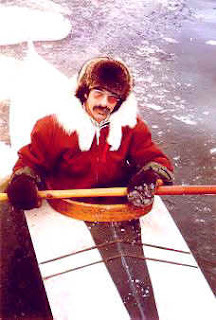 The canoe with the old skin before restoration. Turns out that Old Town actually covered this model with polyester to keep the weight down. I have been doing a restoration on a 15' Old Town Trapper and am more or less finished. What remains? An old-town tag on the stern needs to be mounted and the hull needs a coat of wax. Plus the boat needs to be set in the water for a leak test. Other than that, it's done. And I'm glad that it is. Restoring this particular boat took way longer than I thought it would. Main problem was that somewhere after the start of the restoration, we had to move our shop and after that, it was hard to maintain any kind of momentum on the restoration. There was always something to fix on the new shop. Plus, this time I put canvas on the canoe instead of polyester like I did previously. Way more work. First I had to put on 3 coats of filler. Then I had to sand that. Then it took three coats of sanding primer on the filler to make the hull smooth. Then it took three coats of paint to make the final coat look respectable. Painting the polyester was way easier. All it took was a coat or two to fill the weave, then two coats of paint. Done, minimum of sanding. For one thing, the polyester was a lot smoother than the cotton so filling the weave took almost no effort at all. Anyway, it's done. Pictures follow. And I should mention that I re-caned the seats and repaired some rot damage to the ribs. All that takes extra time, of course. The new skin is on and the inside of the boat has two coats of satin varnish. After I helped to varnish some rowboats at the Dolphin Club, I decided that gloss varnish shows off the wood much better. The decals were puzzling to me. I assumed that they were the old kind that you soak in water and then slide off the substrate. It was only after I soaked the decals in the water and nothing happened that it dawned on me that these were self-adhesive. Way easier to install. Years ago, some friends and I started an organization called The Native Watercraft Society. Our intent was to research and document native water craft or as Bob Holtzman calls them, Indigenous Boats. The Native Watercraft Society eventually died due to the fact that it was too much work to put out a publication - those were the days before free blogging on the internet. Well, it seems that probably without knowing it, Bob Holtzman has picked up the baton where we dropped it and is doing a heck of a job documenting indigenous boats from all over the world. See the link to his blog on the right. Not only is he putting out a whole bunch of good information, he has also provided an index which lets you access blogs by boat type. Very thoughtful and useful. I will have to try to follow his excellent example. So if indigenous craft trip your trigger, make your way over to Bob's blog. I first met Mark Sanders at TAKS a few years ago. Mark not only has the camera gear but also knows how to use it. 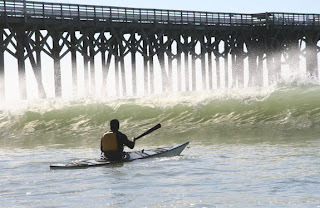 For some spiffy kayak photography, go to his website - Link off to t he right of this blog. See above for a picture of me being eaten by a wave at San Simeon. And in an effort at shameless self promotion, here is a link to a Flash sequence of myself in the surf at San Simeon shot by Mark. Roll or Drown is Duane Strosaker's website. See links at the right hand side of this blog for how to get to his site. Duane, in case you don't know him is one of those people who paddles ten times as much as anyone else. 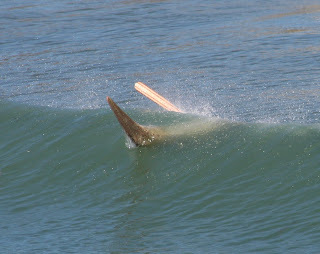 I think he has paddled to more of the Channel Islands in recent times than anyone else. I think he said that he has paddled to all but one of the islands out there. Duane will no doubt correct me if I'm wrong. 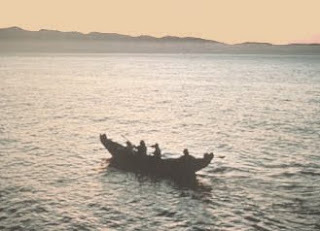 The reason I say that Duane has paddled to more of the islands in recent times is that BWM, that is, Before White Man, the Chumash Indians used to paddle out to the Channel Islands from the coast using their plank canoes. Besides being an avid paddler, Duane is also a builder of kayaks, paddles and practitioner of the Greenlandic arts of rolling and rope exercises. "The U. S. Atomic Energy Commission created a nuclear testing facility on Amchitka in the early 1960s. Three underground nuclear explosions occurred in the 1960s and 1970s. The first detonation was the "Long Shot," an 80 kiloton bomb. The second was "Milrow," a one megaton device exploded on 2 Oct 1969, 4,000 feet below the surface of the island. The third device, "Cannikan," weighing in at 5 megatons, was detonated on 6 Nov 1971. It was the largest underground nuclear explosion in U.S. history. This facility was closed down in 1994, with on-going U. S. Government cleanup of the radioactive, chemical, and other hazardous waste. While there is an airstrip on Amchitka, it is currently restricted to U. S. Government flights only." Question: How do you clean up after detonating 6 megatons worth of nukes? Given that only government flights can land there, cleanup must be iffy. At least they stopped doing above ground testing. Advice: When planning your next Aleutian kayak adventure, avoid Amchitka. 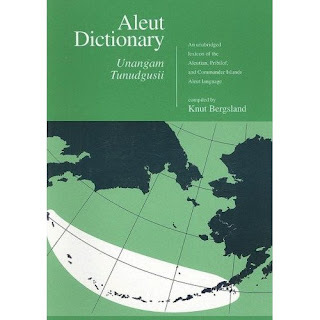 Knut Bergsland, Norwegian linguist contributed an article entitled "Aleut Kayak Terminology" (AKT) to a book called Contributions to Kayak Studies. I have finally gotten around to working my way through it. AKT is not an easy ready, mostly due to Bergsland's forbidding syntax. Still, it's worthwhile reading the article even if you need to sit down to it with a notepad to diagram the sentences before you can be sure what Bergsland is trying to convey. The information in the article is twofold. One type of information derives from the literal translation of Aleut terms for kayak parts. For instance, we learn that the third deck beam of a single-hatch baidarka is also the place where the paddler braces his feet. The fifth deck beam is referred to as the back rest. But interestingly, the fourth deck beam is just referred to as the deck beam next to the opening, that is, the cockpit. The implication is that this deck beam had no relation to the paddler's anatomy, that it was not used by the paddler to brace his knees or thighs. The other type of information in this article is from what I can tell, the most complete enumeration of Aleut kayak accessories to be found anywhere. For instance, we are told not only that the Aleut paddler carried with him a repair kit but also what its contents were. We are also given a detailed list of hunting implements, everything from sea otter darts to whaling lances. Glad you asked. As everyone probably knows by now, former military bases are the equivalent of toxic waste disposal sites. The military, at least on US bases has cleaned up its act and complies with various environmental laws. Overseas is another matter. But for now, let's focus on the US, more specifically on the former Alameda Naval Air Station (Alameda, NAS) where my shop is. In the past, the military dumped anything and everything liquid on the ground or down the sewers and after that, it was out of sight and out of mind. Back then, dilution was the solution. Nowadays, things have changed. The stuff the military dumped in the ground or down the sewers is still there, clinging, slowly dispersing, looking for a place to go. Meanwhile, the cold war ended, Clinton closed military bases and the department of defense looked for buyers for their decommissioned bases. Developers vied to tilt up condos and strip malls on the abandoned bases. But wait .. enter, stage left, the lawyers. The military has them and so do the developers. Somebody discovered that there was BAD STUFF in the ground and lawyers got wind of that. The long and the short of it is that the military's lawyers determined that stuff in the ground meant lawsuits down the road. Build a house on top of the toxin infused dirt and somebody's kid gets cancer. Kid's parents file a lawsuit, find a sympathetic jury and the military owes way more money than they sold the base for. Enter the cleanup crew. The lawyers said, no lawsuits. Hence clean it up before the military sells it. Expensive, but what the heck, cheaper than a lawsuit. So here we go. Coming back to the Alameda NAS, not only did the Navy dump fluids in the ground, they also flushed various radioactive materials down the sewer. Again, this was small scale stuff, like the radioactive material that went into military instruments to make the phosphors in the various gages light up. But there it sat in the sewer line, waiting for a lawsuit. But, the lawyers found out and the cleanup started. It will be over soon. The fences will come down. 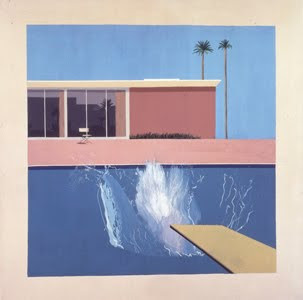 I will have access to the water once again. Pictures to follow. That little sliver of water to the left has a little beach abutting it at low tide. The Navy put up a chain link fence to keep people off the beach. Reason? Apparently, the sand and mud of the beach is saturated with toxic chemicals. If people play on the sand, the toxins get into the water when the tide comes in. There's signs in at least four languages telling us not to go near the water or eat fish or shellfish that live in it. This sign is in Chinese. Other signs are in English, Spanish and Vietnamese. The yellow building to the left is our old shop building. We have been kicked out of it. The white building to the right is the source of solvent contamination. The solvents are in the ground, working their way in the direction of SF Bay. The white trucks are there to transport contractors who put probes down in monitoring wells to find out how far the solvents have gotten. Meanwhile, on the other end of the seaplane lagoon, the radioactive cleanup is going on. The fence at the left which is converging toward the horizon runs parallel to the sewer line that drained the radioactive materials into the bay. Here's another view, this one of the guard shack at the far left and blue water containers to the right of the shack. The water containers fill up spray trucks which run back and forth and keep everything wet so radioactive dust does not get blown about by the wind. Here is a pile of toxic dirt. It has been sprayed with something that binds the surface and prevents the wind from disturbing it. And here is the last of the work to be done. Beyond the fence is a trench in which the new sewer line has been laid so that it can now drain clean, unradioactive water into the bay. Actual radioactive material that got into the sewer is probably minimal. Nobody on the site is wearing lead suits. The whole thing is probably a boondoggle with the prime beneficiary being the toxic remediation contractor. Nevertheless, we, the taxpayers benefit from all this activity because it is still cheaper than a lawsuit. Meanwhile, I am waiting for it to be all done so the fences can come down and I will once again have a nearby place to launch my kayaks. I know that two, possibly three people follow this blog. Now you have a chance to announce the fact that you follow this blog. Announcing yourself gives me some idea of who's reading the blog and gives me a chance to target its content at a given audience. See followers gadget in the right margin for details. Click somewhere and see what happens. Haven't tried it myself so I'm not sure how it will work. Berkeley has this restaurant called Spenger's Fresh Fish Grotto. I don't know how good their food is, but if you're ever in the area, probably to rub elbows with the area's well-to-do or to spend 15 minutes in line to get coffee at Peet's on fourth street, stop by Spengers to check out their small collection of nautical stuff scattered around the outside of the building. The most notable item in their collection is a small dugout canoe. I thought for some time that it was local, but am beginning to doubt it. More likely Polynesian. Anyway, here's some pictures of it. Kinda looks like the fat parts of the hulls are where the amas of the outriggers would have crossed, or is that just where the thwarts went? Don't know much about dugouts. And yes, believe it or not, the SF bay had a whale processing plant until sometime in the 60's over in Richmond. 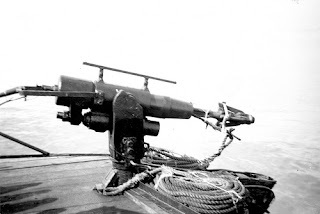 And there's a harpoon on one of the last whale boats. NRC dweebes are getting ready to tow a boom out to the oil spill to contain it. 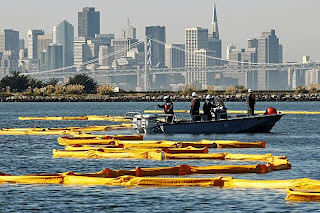 We're having our annual oil spill here in SF bay. Routine stuff by now. "They", whoever they are closed all the beaches and boat ramps facing the bay here in Alameda to allow workers in hazmat suits dab gobs of oil off rocks and the beach with wads of kleenex. Other fine folks are washing oily ducks. Duck death toll so far is 22, not from being washed I presume, but probably from getting oiled. Meanwhile, boat testing is suspended since I can't get on the water except by launching off the rocks you see in the background of that picture. There is a little beach that I could launch off, except that is closed right now while another set of contractors is cleaning up the radioactive sewer which the navy used to use to run radioactive waste into the bay. Oh well, it's a toxic world we live in.